Digiwave RG621500B 500-feet RG6 Coaxial Cable is professional-quality cable with 18 gauge copper clad steel center conductor. Cable also swept-tested to 3000MHz(3GHz) to assure excellent off-the-reel performance. This cable heavily 60% shielded with 100% foiled to minimize interference. Copper clad steel conductor maxima the cable length you can run. Cable jacket is sequentially marked to keep track of cable used. 100 ft. RG6 Coaxial Cable in White The RG6 coax cable is used for CATV-community antenna television and VCRs and CCTV-closed-circuit television. It uses F-plugs to connect on both ends. It features low-loss, double shielding which ensures less interference in your picture and sound. 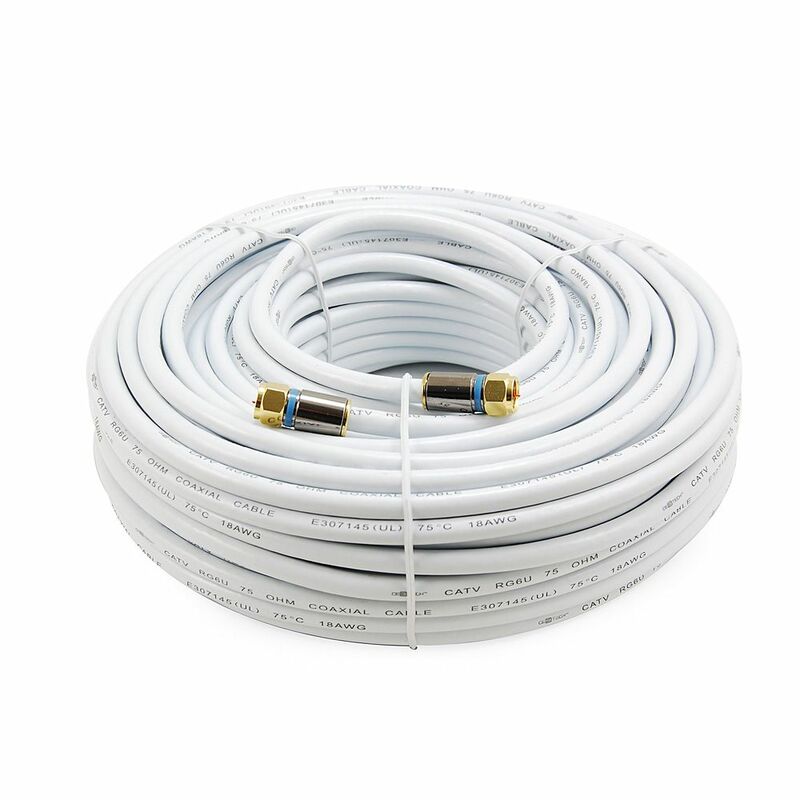 100 ft. RG6 Coaxial Cable in White is rated 4.9 out of 5 by 10. Rated 5 out of 5 by JIOLAS from I used this product to connect my outdoor antenna to my house TV splitter and it works great. I n... I used this product to connect my outdoor antenna to my house TV splitter and it works great. I now get clear free HDTV reception on my flat screen digital TVs. Rated 5 out of 5 by RSD from Used 100ft cable to extend cable TV into garage. No kinks. Cable was easy to work with and clear ... Used 100ft cable to extend cable TV into garage. No kinks. Cable was easy to work with and clear reception. Very happy. Recommend. Rated 4 out of 5 by BB from Well made. ... Well made. Rated 5 out of 5 by HomeDepotCustomer from This cable was quality, and priced much better than Bestbuy.... This cable was quality, and priced much better than Bestbuy. Rated 5 out of 5 by Tink from A little higher priced than I had hoped for such... A little higher priced than I had hoped for such old cabling but it gets the job done. I do love Home Depot.